A Interim Group Management Report 5 Executive Summary 12 Property-Casualty Insurance Operations 22 Life/Health Insurance Operations 28 Asset Management 32 Corporate and Other 35 Outlook 37 Balance Sheet Review 44 Reconciliations Interim Report Third Quarter and First Nine Months of 2014 Allianz Group 13 Cluster 1 In Asia-Pacific gross premiums increased to € 201 MN. The strong growth of 25.1 % on an internal basis was mainly due to a volume increase in our motor business in Malaysia. In the United Kingdom gross premiums grew by € 147 MN to € 690 MN. The internal growth of 18.1 % was driven by our motor and pet insurance business as well as tariff hikes in our commercial lines. 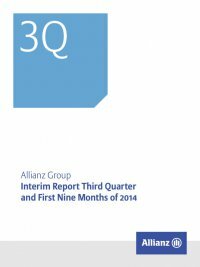 AllianzWorldwidePartnersrecordedgrosspremiumsof€ 656 MN – up 9.2 % on an internal basis. This reflected a rise in volume in our U.S., French, New Zealand and U.K. travel business. In Australia gross premiums stood at € 799 MN. The increase of 5.5 % was largely a result of higher volumes in our home and worker’s compensation business. In Germany gross premiums were at € 1,979 MN. The internal growth of 4.1 % was largely driven by our motor retail and commercial non-motor business with positive price and volume effects. Cluster 2 In Latin America gross premiums went up to € 581 MN. The 14.7 % growth on an internal basis was mostly due to greater volume in our motor business in Argentina. In Credit Insurance gross premiums stood at € 530 MN, a rise of 7.9 % with positive volume effects in the U.S., Asia-Pacific and Middle East. At AGCS gross premiums amounted to € 1,365 MN – up 10.3 % on an internal basis. The rise was mainly driven by higher volumes through new business and upsells in our liability and engineering lines. The negative price effects in our aviation and energy lines were partly offset by positive trends in our marine business. In Spain gross premiums totaled € 437 MN. The growth of 5.0 % was the result of a volume increase across all our lines of business. Cluster 3 In the United States we recorded gross premiums of € 612 MN. The decrease of 6.0 % on an internal basis was the result of a decline in volumes in our commercial lines and lower commodity prices for crop. In Switzerland gross premiums totaled € 259 MN. A positive vol- umeeffect,particularlyinourmotorbusiness,couldnotcompensate the negative price impact and led to a decrease of 2.6 % on an internal basis. In France gross premiums were € 962 MN – a slight decrease of 0.1 % on an internal basis. The negative volume effects outweighed positive price effects. Cluster 4 In Central and Eastern Europe gross premiums contracted to € 522 MN – a decline of 12.3 % on an internal basis. The negative development was largely driven by a drop in volume in our motor business in Russia, as we reduced our business activity in this region. Positive develop- ments in Romania, Slovakia and the Czech Republic could not offset the overall negative impact. In Italy gross premiums fell by 0.6 % to € 933 MN. This was attrib- utable to falling prices as well as regulatory changes weighing on volumes, particularly in motor business. 2014 to 2013 first Nine Months comparison On a nominal basis, gross premiums increased by 2.0 %. Adjusted for foreign currency translation and (de-)consolidation effects, this rep- resents a growth of 3.0 %. This was comprised of a positive volume effect of 2.6 % and a positive price effect of 0.3 %. Operating profit Operating Profit € mn three months ended 30 September nine months ended 30 September 2014 2013 2014 2013 Underwriting result 650 501 1,871 1,397 Operating investment income (net) 770 718 2,323 2,266 Other result1 2 16 64 70 Operating profit 1,422 1,235 4,257 3,733 1 Consists of fee and commission income/expenses, other income/expenses and restructuring charges. 2014 to 2013 third quarter comparison Operating profit increased by € 187 MN, or 15.2 % to € 1,422 MN. This was mainly driven by the absence of major natural catastrophe impacts in the third quarter of 2014. Our underwriting result grew by € 150 MN to € 650 MN due to an improvement in our accident year loss ratio, which stemmed from significantlylowerlossesfromnaturalcatastropheevents.Thisresult was partially offset by a higher impact from single large claims and by a lower run-off contribution compared to the third quarter of 2013. The combined ratio improved by 1.3 percentage points to 93.5 %.